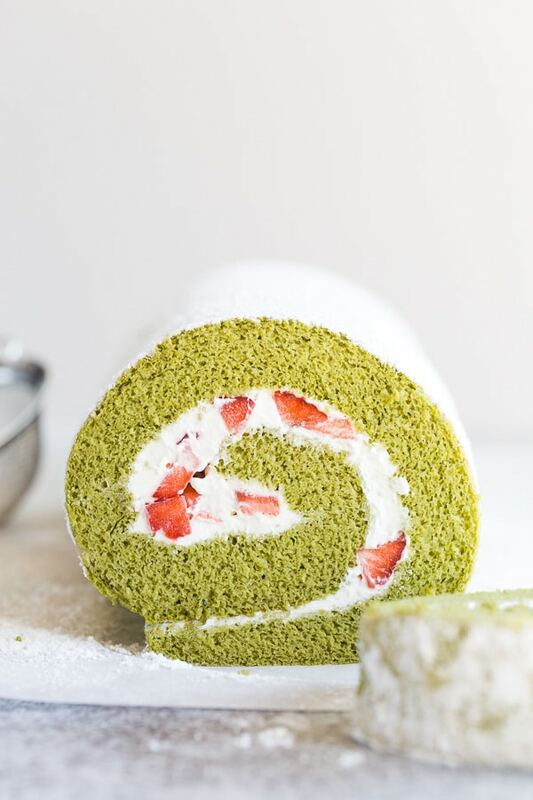 This ultra-light and fluffy strawberry matcha roll cake is an easy and elegant spring treat! Delicate sponge cake flavored with Japanese green tea powder and filled with fluffy whipped cream and fresh strawberries. DIVINE! Doesn’t this beautiful roll cake just scream spring? Anyway, I absolutely love a good cup of matcha. I also love baking with it. It has an earthy, grassy, yet sweet flavor. I feel like it has a calming effect to it too. I don’t know, it might be in my head, but I enjoy my matcha time so much! In case you’re not familiar, matcha is a high-quality green tea leaves, specially grown in a shade, dried and ground into a powder. There are a few grades of matcha on the market, from super high quality, used for tea ceremonies, to culinary grade and everything in between. I don’t recommend culinary grade matcha for baking. They tend to be very low quality with dull color and bitter taste. 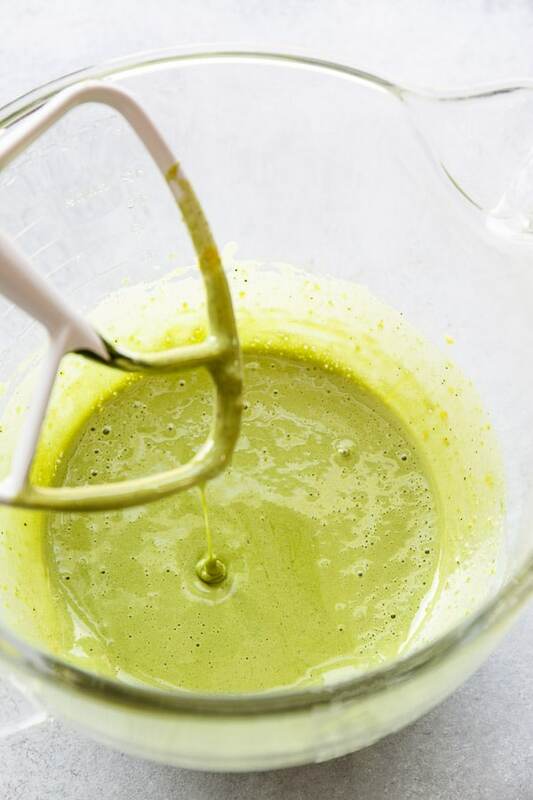 And you likely won’t get this vibrant green color with culinary grade matcha powder. I buy a good quality green tea (not super expensive stuff) that I can both drink and bake with, because the shelf life of matcha is not very long. Matcha powder is very sensitive to heat, light, air and loses its quality pretty quick. Once opened, green tea powder is best when used within couple of months for optimum taste and color. I had once baked with an old matcha powder (before I knew better), and the result was not good, to say the least. Bitter, dull brown color, absolutely nothing to brag about. So pick a good quality of matcha to drink and bake. It doesn’t have to be super high-end expensive one. I loved this pure matcha from Tea Forte. 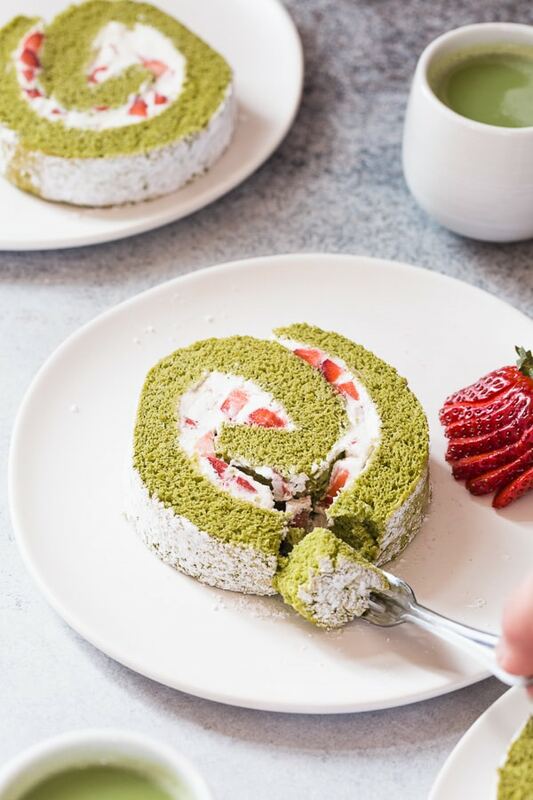 WHAT DOES MATCHA CAKE TASTE LIKE? 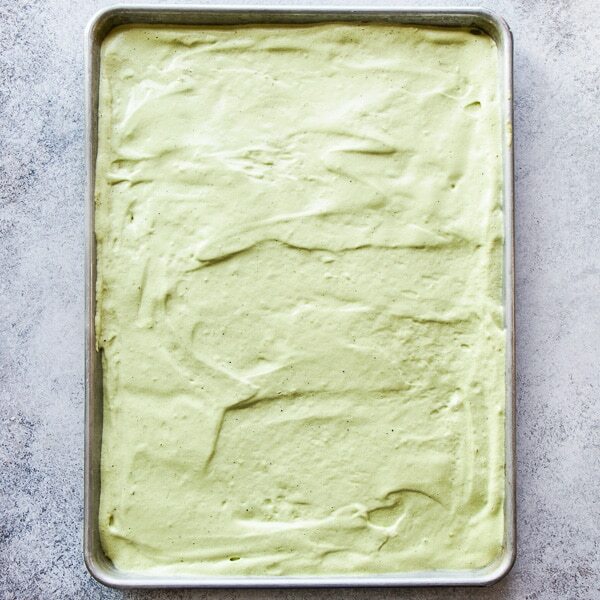 Matcha green tea powder infuses a cake (or any baked goods) with its delicate yet earthy, sweet yet slightly bitter flavors. 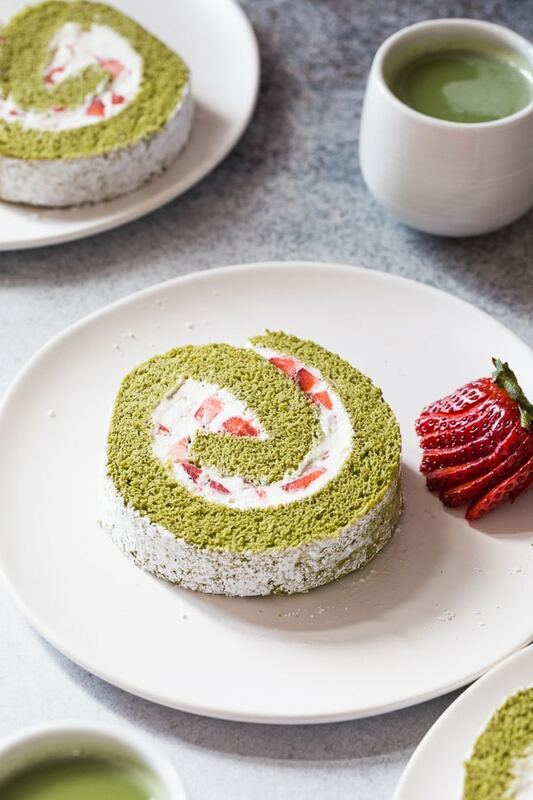 This matcha roll cake isn’t very sweet, which makes it a great dessert for those who appreciate less sweet treats. 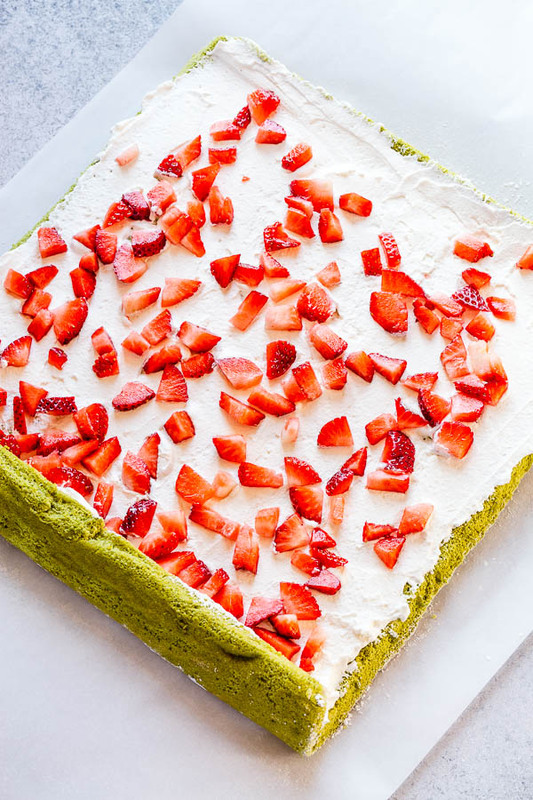 Fluffy whipped cream pairs beautifully with the matcha sponge cake, and sweet strawberries add burst of freshness and texture to the cake. 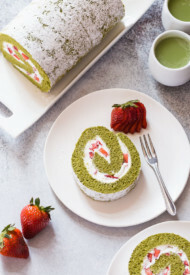 HOW TO MAKE MATCHA ROLL CAKE? Let me show you how to make this beautiful spring roll cake, step by step. 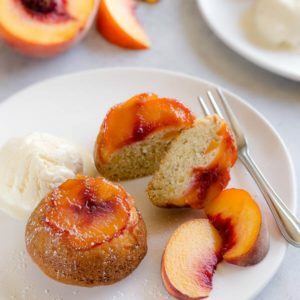 It’s really quick and easy dessert, that you can also make it ahead. Winner! 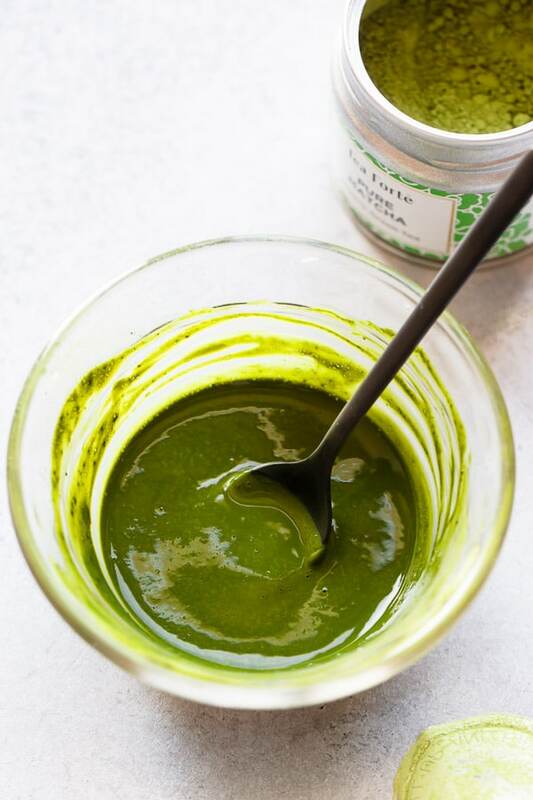 Start with making a smooth matcha paste by mixing matcha powder with a little bit of hot water. And then make a quick sponge cake batter. Just like I had showed you in my classic sponge cake tutorial, we’ll beat egg yolks and half of the sugar until pale yellow and tripled in size. Then we’ll stir in the prepared matcha paste. Sponge cake doesn’t use any chemical leavening agent. Instead it rises due to all the air in the whipped egg yolks and egg whites. That’s why it’s so important to properly whip the egg yolks and egg whites separately. Whip the egg whites with the remaining sugar until stiff peaks, which means if you flip the bowl with whipped egg whites upside down, egg whites won’t slide off. TIP: Make sure there’s absolutely no trace of oil, or egg yolk in egg whites, or it won’t whip into fluffy white stiff peaks. Carefully fold half of the egg whites into the egg yolk mixture. And then add remaining egg whites and gently fold until almost smooth. Next step: sift the cake flour into the egg batter. Sifting the flour aerates it, which helps to make a fluffy cake! If you don’t have a cake flour, you can easily make it yourself. You’ll need to measure 1 cup of all-purpose flour, take out 2 tablespoons of flour, and replace it with 2 tablespoons of cornstarch. Sift it and voila! Again, it’s very important to mix the batter gently to keep it airy and fluffy. Spread the batter evenly on baking sheet, lined with a parchment paper. You don’t need to grease the pan! Since it’s such a thin cake, it takes less than 10 minutes to bake. Don’t go anywhere! 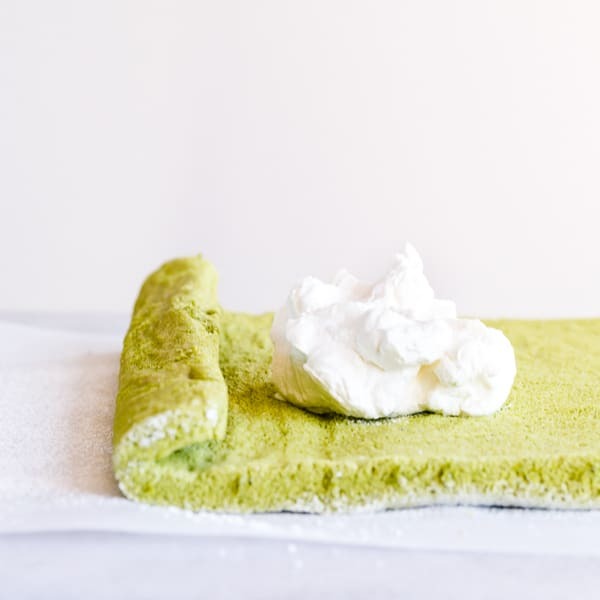 While the cake is baking, prepare a clean kitchen towel on a counter and generously dust it with a powdered sugar. As soon as the cake comes out of the oven, invert it onto the prepared towel and roll it with the towel and all. This helps the cake roll without cracking by creating a muscle memory. Set the rolled cake on cooling rack and cool completely. 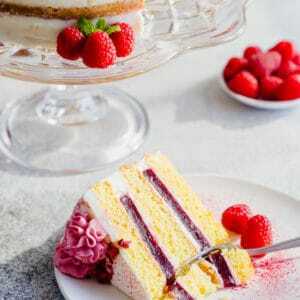 Once cooled, unroll the cake and spread half of the whipped cream over the cake and sprinkle chopped strawberries. Then spread the remaining whipped cream over the strawberries and roll the cake into a log. Dust it with powdered sugar and serve! I can’t wait for you to try this delicate and fresh strawberry matcha roll cake. It’s quite a treat! And so impressive without much effort. To make the sponge cake, preheat the oven to 375° F (190° C). Line baker’s half baking sheet (about 16.5 x 11.5 inches) with parchment paper. 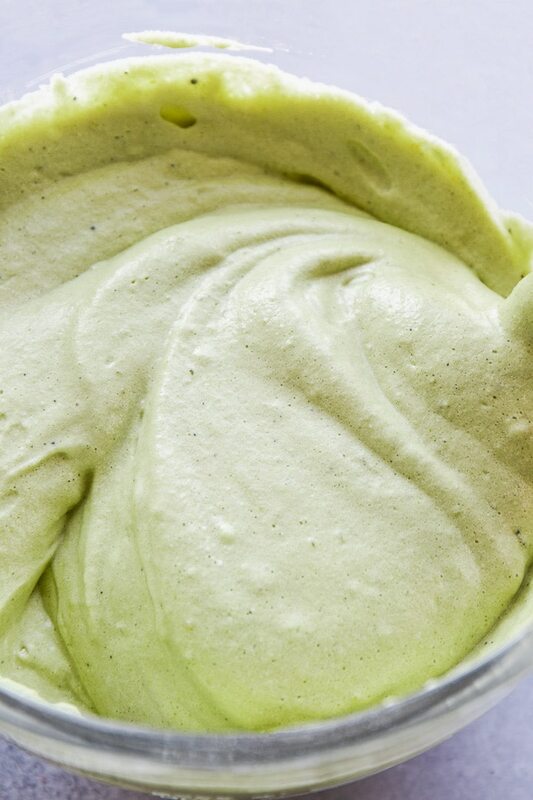 In a small bowl, mix matcha powder with 1 tablespoon hot water until smooth. 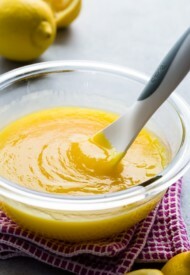 In a separate medium bowl, whisk the egg yolks and ¼ cup of sugar until pale and tripled in size, about 2 minutes. Mix in the matcha paste. In a mixing bowl with whisk attachment, beat the egg whites on medium speed until frothy. Add remaining ¼ cup of sugar one tablespoon at a time. Increase the speed to medium high and continue to beat until stiff peaks form. Add half of whipped egg whites into the egg yolk mixture. 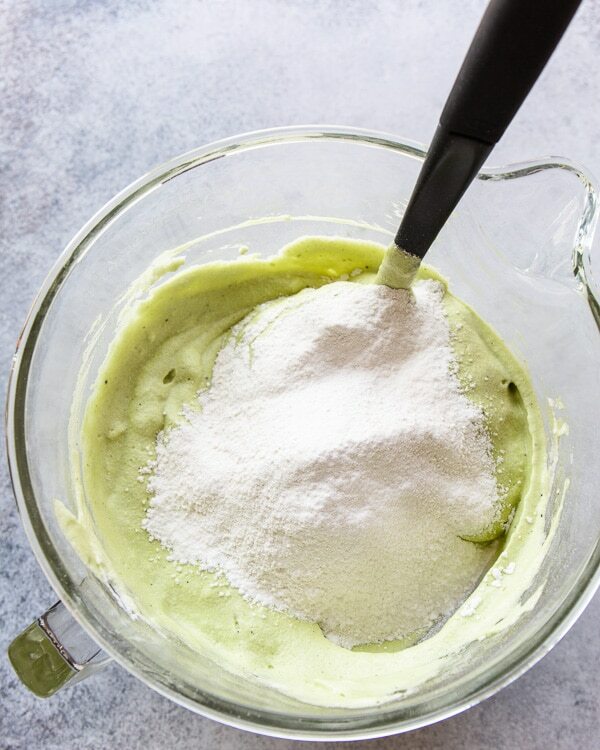 Gently fold the batter with a spatula until almost smooth, and then add the remaining whipped egg whites. Carefully fold the batter until smooth. Sift in the cake flour and salt. Gently fold it until the flour is fully incorporated. Pour the batter into the prepared baking pan. Using an offset spatula, spread the batter evenly and smooth the surface. Bake for 8-10 minutes, or until inserted toothpick comes out clean. Meanwhile, lay a clean kitchen towel on the counter and generously dust with powdered sugar. Once the cake is out of oven, immediately invert it on the prepared kitchen towel. 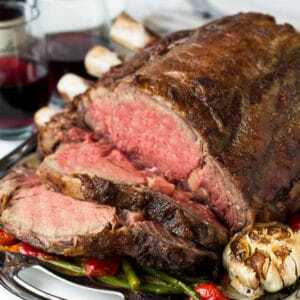 Peel off the parchment paper and roll it with the towel and all. (This helps the cake roll without cracking by creating a muscle memory.) Set the rolled cake on a cooling rack and cool completely. 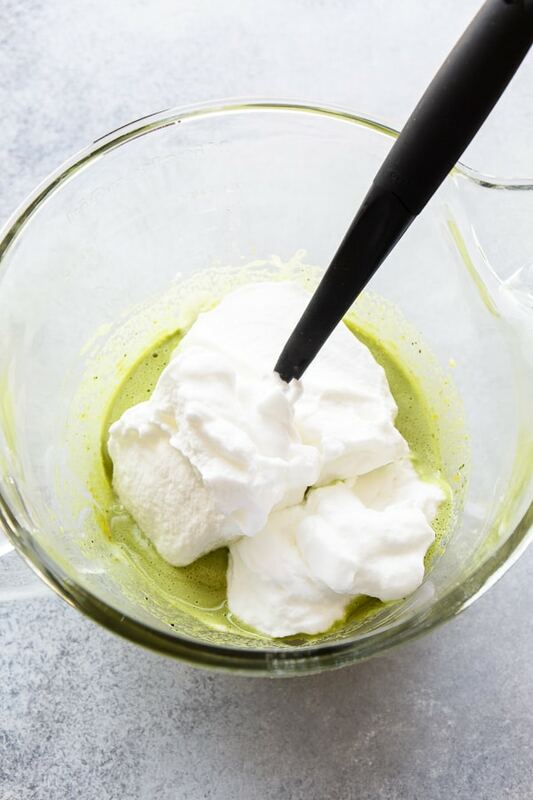 To make the whipped cream, in a mixing bowl with a whisk attachment, beat heavy cream on low speed until frothy. Add sugar and continue to whip on medium speed until hard peaks form. Refrigerate until ready to use. To assemble, once cooled completely, unroll the cake and spread half of the whipped cream over the cake and sprinkle chopped strawberries. Then spread the remaining whipped cream over the strawberries and roll the cake into a log. Dust with powdered sugar and serve! Refrigerate the cake, covered, if not serving right away. 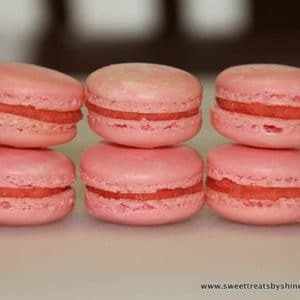 This recipe was originally published on May 13, 2015. That looks amaaazing! 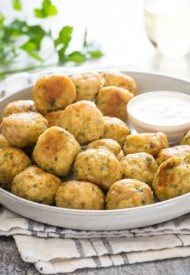 Is there an alternative to eggs to make the sponge vegan?? Hi, Avgi! 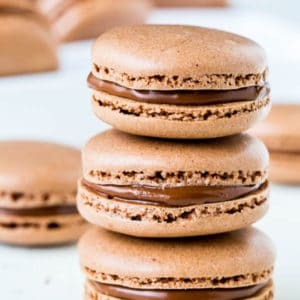 Unfortunately I have zero knowledge on vegan baking and can’t offer any advice on substitution. I’m a little late, but the next time you cook chickpeas, save the extra water. 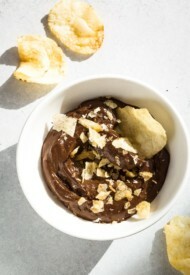 It can be whipped into a meringue. Hello ! I would like to know if I can make this cake into a layered one with the fresh strawberries instead of rolling it and if you have any tip for me about that ! Thanks a lot ! This looks so lovely Shinee. I could have a piece now with a cup of tea:) Visiting from Freedom Fridays. I could use a slice of this too. 🙂 Thank you for visiting, Belinda! Sure thing, Veronika. I’m glad you liked it. OMG, looks so good! Love it! I’d love it if you shared this on Worthwhile Wednesdays. Strawberry & matcha is such a great combo. This cake look so delicious, I’m going to have to try this out. Found you @ Lou Lou Girls. What a neat idea! Found you at Monday Funday. How did I miss this one? Especially because I am she whose roll cakes ALWAYS crack! The step by step photos are exactly what I need, thank you! And of course, being Japanese, the matcha flavour just ticks an extra box…. Nagi, this cake is practically crack-proof (haha did I just made up a new word?). I’m glad you found the step-by-step photos helpful. Thanks! This looks so good! And I SOOO appreciate the additional information on matcha and the tips to using it well. I hadn’t realized it needed to be used so quickly! You’re welcome. I’m glad you found the tips helpful. Fresh match makes all the difference. Thank you for stopping by, NellieBellie! I need to get on board the matcha train! I drink green tea but never had nor worked with matcha. This cake looks delicious and I love the colors. Have a wonderful visit with your family! I love a good cake roll! Enjoy your trip! I love matcha green tea powder!!! LOVE this roll cake!!!! I just saw a cookbook with all recipes involving matcha. . isn’t that awesome?! And a ticket to Mongolia?!!!! so awesome! so happy for you that you will see family!!! happy dance!!!! Oh my, I need that book in my life! 🙂 Thanks, Alice! Congrats on your trip! Gosh I can’t wait to see all the beautiful photos when you return. Also this cake is absolutely gorgeous! Me too. 🙂 Thanks, June! Thank you so much, Thalia! You’re too sweet! What a gorgeous cake! I have to admit, it looks intimidating to me! But so yummy! Have a great trip!! Thanks, Michelle. It’s actually easier you may think. 😉 Hope you give it a try. That tea sounds interesting. Let me know if you remember the name of it. I’m always in the look out for the next best tea! 🙂 Thanks as always for stopping by, Beeta! This looks amazing! Do you think this would work with gluten free flour? Lauren, honestly, I never used gluten-free flour, so really have no advise on that. Sorry. Oh wow, what a GORGEOUS color combo!